when a career counselor career transitions | Career Counseling for Your Career Bliss | make. believe. for real. When I started this website and online library (I don’t like the word ‘blog’), I didn’t know what it would become. I was a Career Counselor and that’s all I knew. And then I started to write articles … about career counseling. I worked one-on-one with clients (still do) and did cameos in corporations that wanted me to offer a team building or professional development workshop (which I do when the chemistry feels right). And about four years in, I started to write a book. I’ve been pretty quiet about it because I didn’t know if I could finish a book. I totally have my doubts and I still do. Partly because I’m legally an extrovert (just kidding, it doesn’t work like that), but I live a life with copious amounts of solitude. I haven’t decided if I’m an extroverted hermit or if I’m the most hermit extrovert I’ve ever seen. The only thing that I knew going into this book writing thing was that a book wasn’t going to write itself. If I was faint of heart or busy doing other things, like talking to people, writing wouldn’t be a consistent activity. So I practiced writing for a long, long time. And a few years in, I noticed something very peculiar. While I still am a Career Counselor, I noticed that when I talked to people about what I did, something was feeling different. Totally off. I didn’t know how to talk about myself anymore. I noticed the day that telling people what I did and how I did it felt like a pair of pants that had gotten too tight. It happened a few more times before it registered that it was that old familiar feeling that I didn’t know who I was. Only this time, it didn’t scare me at all. I posted fewer and fewer articles and I haven’t posted anything in awhile (save for a few private notes to subscribers), not because I didn’t have things to write about, but because I was in the middle of a transition. 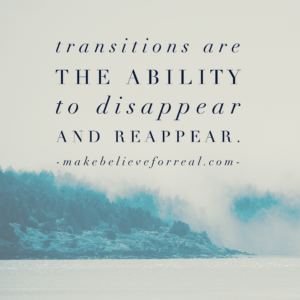 Transitions are about disappearing and reappearing. And what happens in between pretty much remains a secret. But I decided that I don’t want it to be that way. What if I revealed the life of someone in transition? What if I let you in on what it’s like to transition from being one thing to becoming something else? What if people don’t transition because they think it’s this weird and yucky process where people ask you all kinds of questions that you don’t have answers to … yet? And what if that was okay? And even a good thing? The reason I was struggling to speak about myself was because my life is lived as a Writer that does career counseling, rathar than as a Career Counselor that writes. And I was surprised when the tipping point for that arrived. I had no idea that it was even coming. So you’ll see a shift in what I write about because I’ll write about writing and I’ll write about career counseling and this is in part because of you. Without exception, every client I’ve ever worked with has a writer’s voice that has wanted or needed an outlet. Not everyone I’ve ever worked with wants to be a Writer for a living, but their voice has needed a space or permission or gentle coaxing out into the open. Voices powerful because they are full of the person’s essence rather than their ego that could never represent them well. It’s the act of writing that has allowed my clients to know themselves deeply, and that has made their speaking voice more representative of who they are, and that makes their career choices in the day-to-day of their work more potent. Your developed voice leads to the career in the heart of who you are. This is what I know as a Career Counselor and as a Writer. And if you want to take a look at the book I’ve got in the works, you can preview it here.